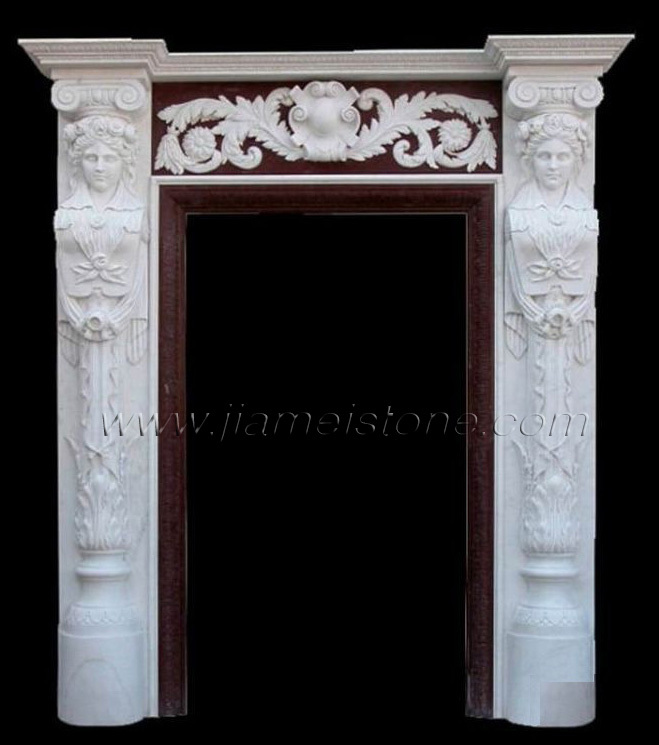 Art work of past generations of incredibly talent sculptors have turned the China's finest stone work into a proud tradition of creating the unrivaled beauty. 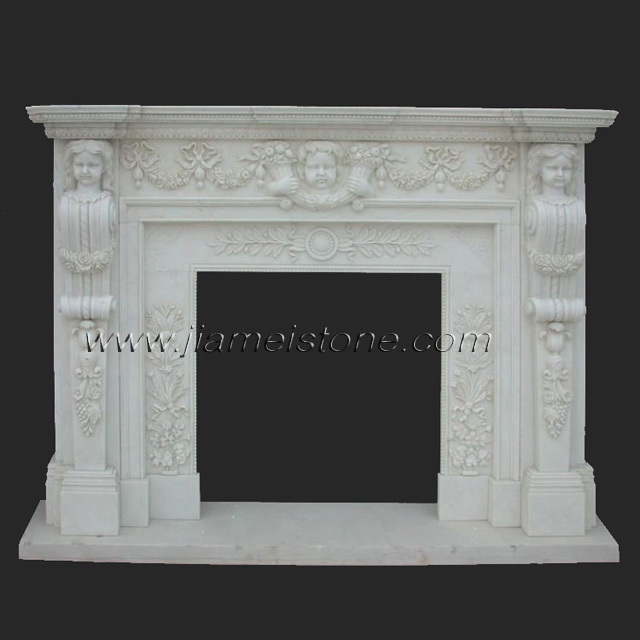 This series of marble fireplace is a perfect example. 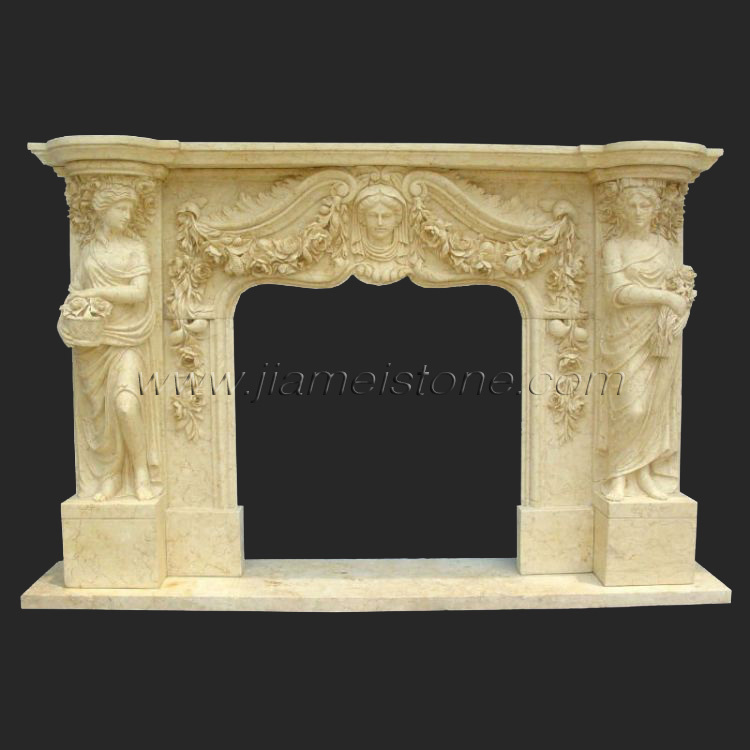 Jiamei designs, manufactures and supplies large selections of statue carved marble fireplaces ranging from classic replicas to modern custom designs, from Italian Roman style marble fireplaces to French style contemporary marble fireplace. 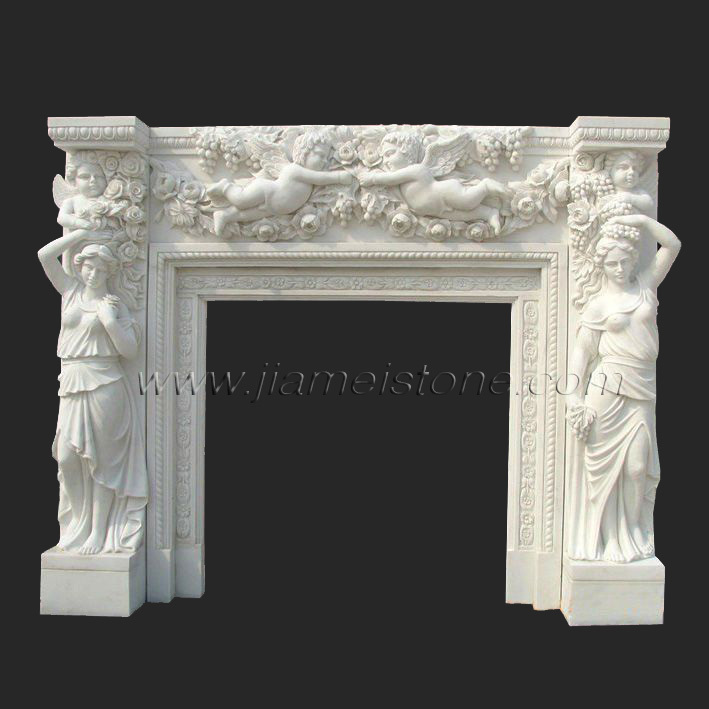 Statuary stone fireplaces are best carved with marble, limestone and travertine for intricate presentations. 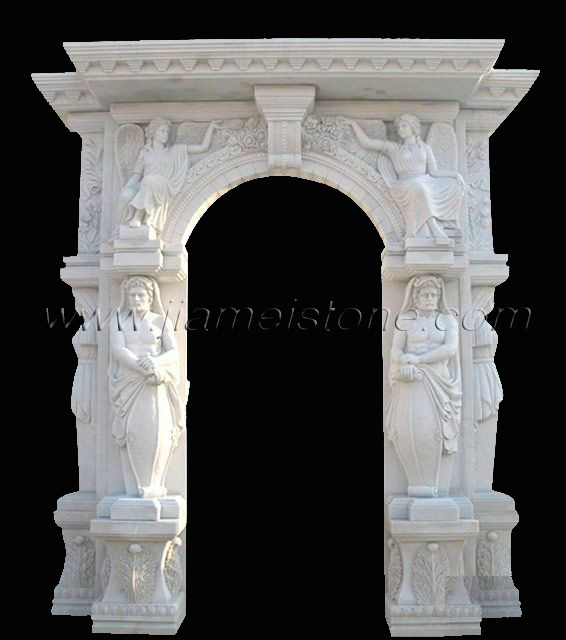 Custom designs, colors and dimensions are available. 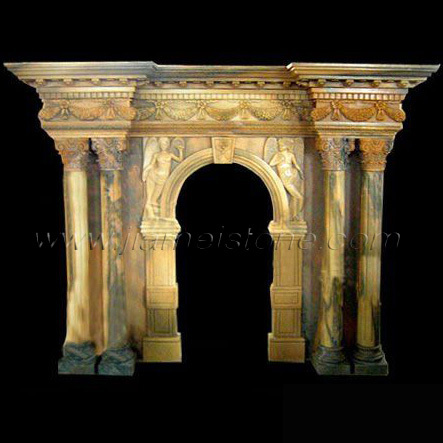 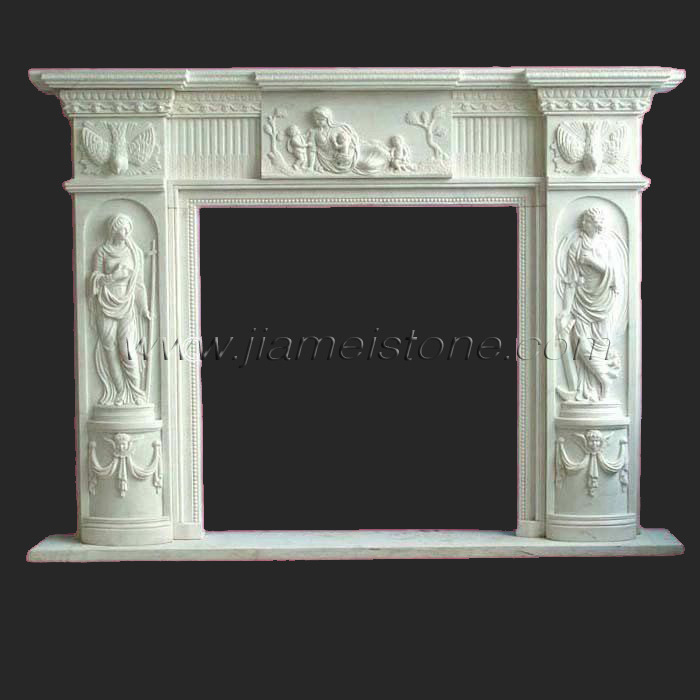 This series of fireplace mantel surrounds are more than just stone mantels they are valuable art pieces indeed. 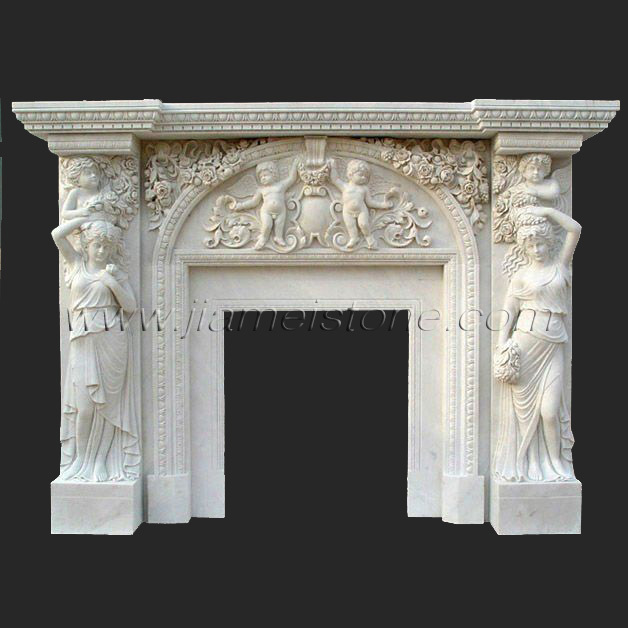 From classic reproduction to modern design, from Victorian marble fireplace to French style contemporary fireplace, from Marble to limestone, from sandstone to travertine, from standard residential size to large church style, Jiamei stone specializes in custom marble fireplace designs and productions. 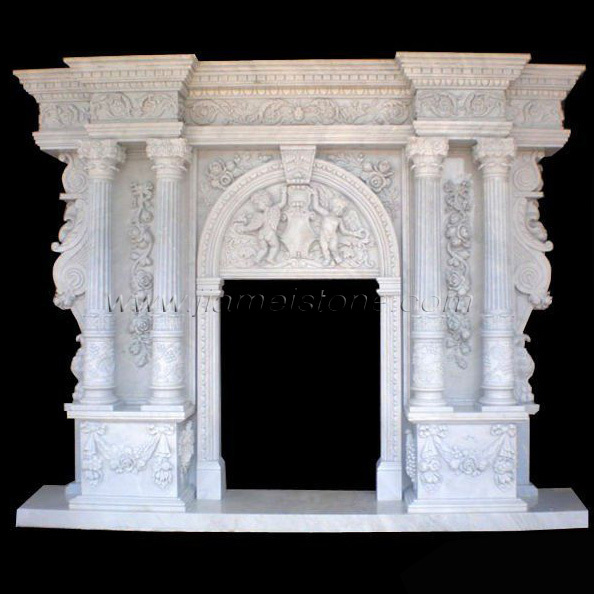 Listed in this section are just sample styles of popular statue carved stone fireplace mantels. 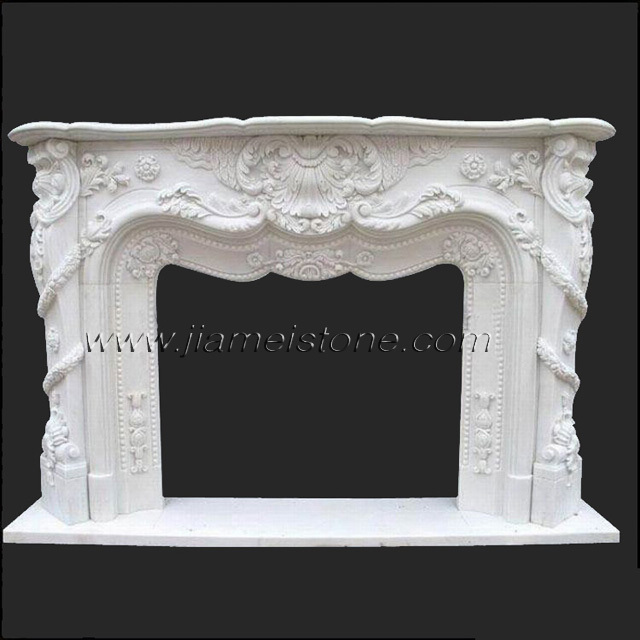 If you already had specific marble fireplace designs in mind but do not see in our site, please send us drawing or image, we do the rest. 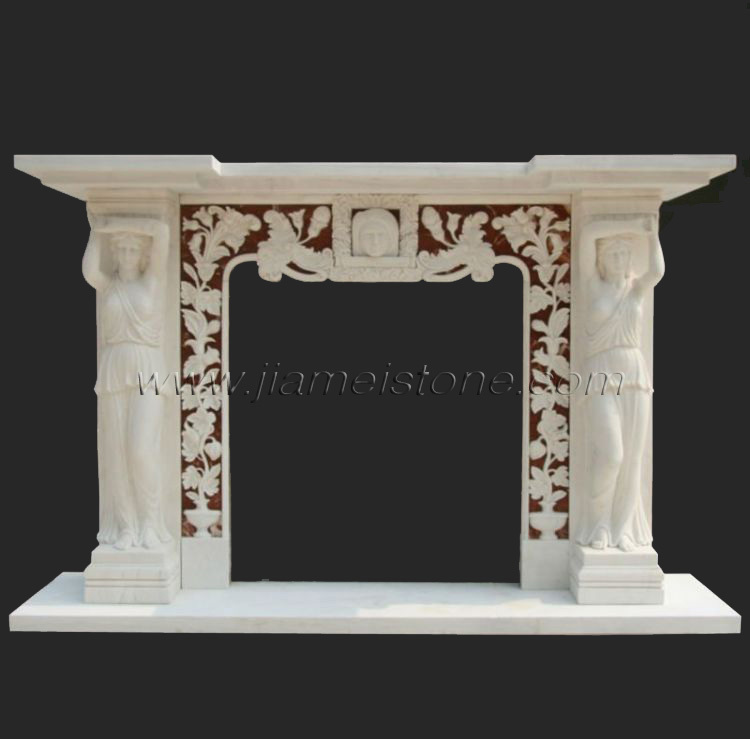 Call us to find out what decorative fireplace mantel and surrounds we have in stock. 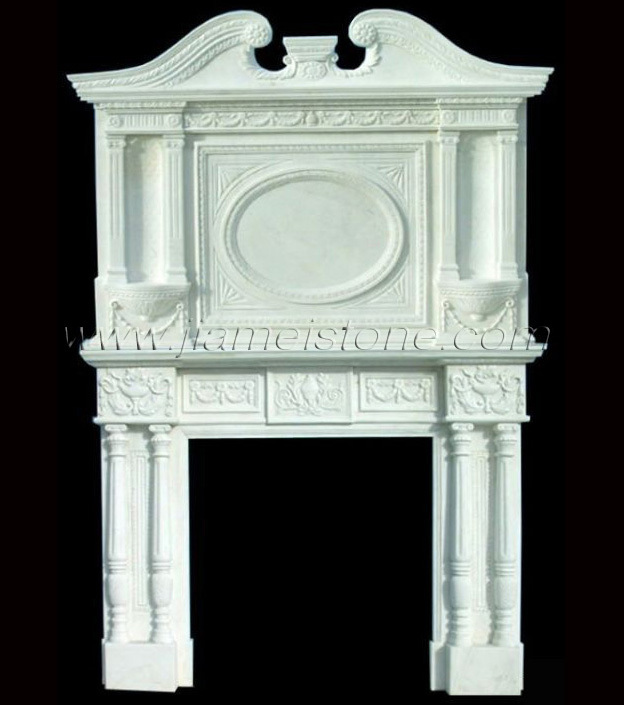 The common dimension for this series of fireplace mantel surround including hearth is 69" wide 55" high with a opening of 40"w 32"h. However, we will custom size each fireplace mantel surround to match your space configuration. 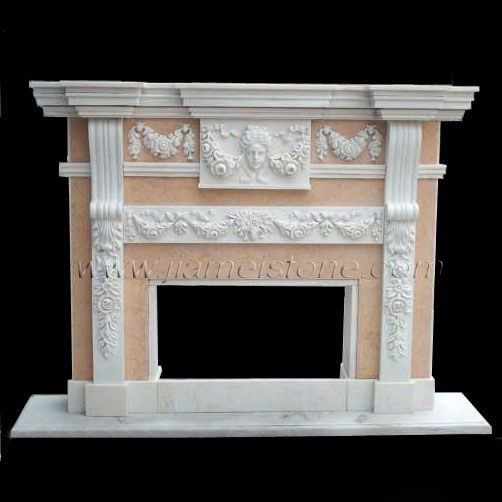 Although marble is the most popular material for this series of stone fireplace, travertine, limestone and sandstone are also good alternatives to consider. 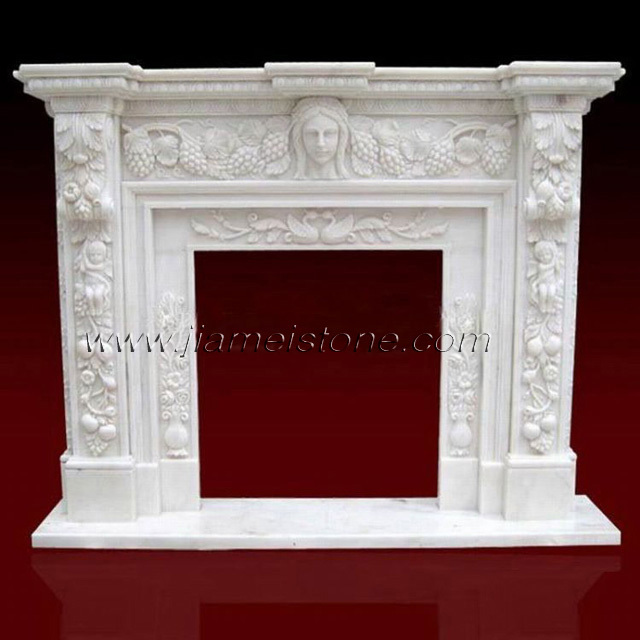 This series of elegant marble fireplace mantel from hands of master craftsmen are the most popular fireplace mantel and surround choices in America. 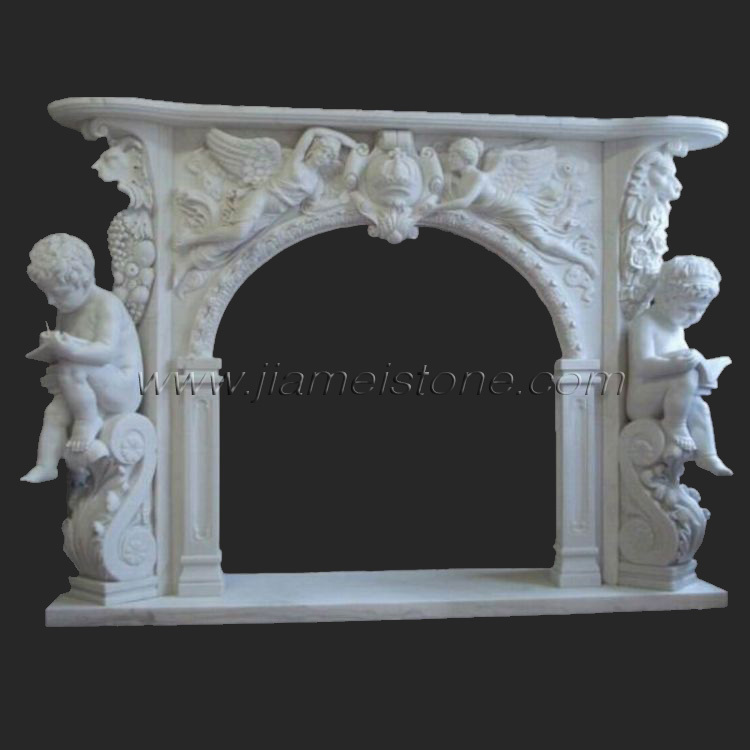 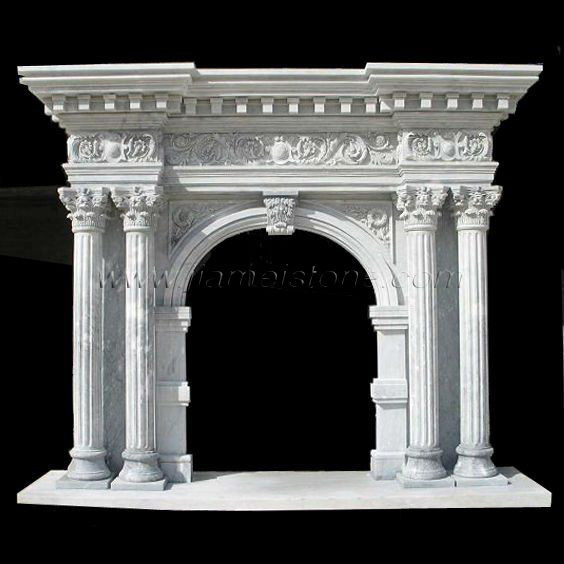 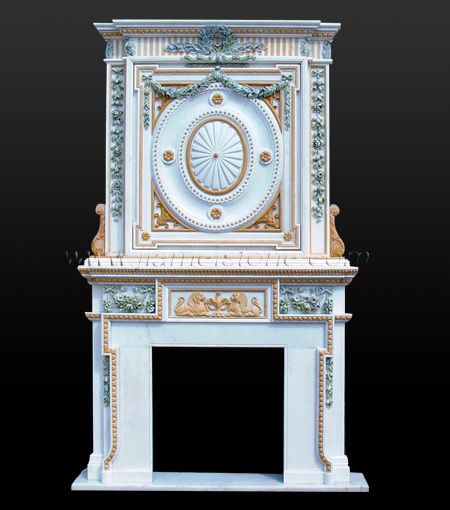 Jiamei and its partnering carving facility design, carve and supply over one hundred styles of flower carved marble fireplace surrounds, featuring exquisite French style marble fireplace mantel, magnificent Victorian style marble fireplace and classic English style marble fireplaces. 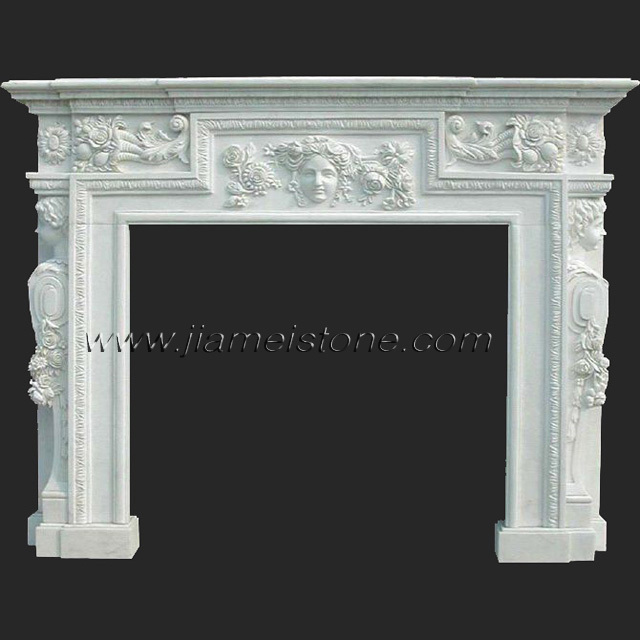 This series of stone fireplaces are available in marble, limestone, travertine, and sandstone. 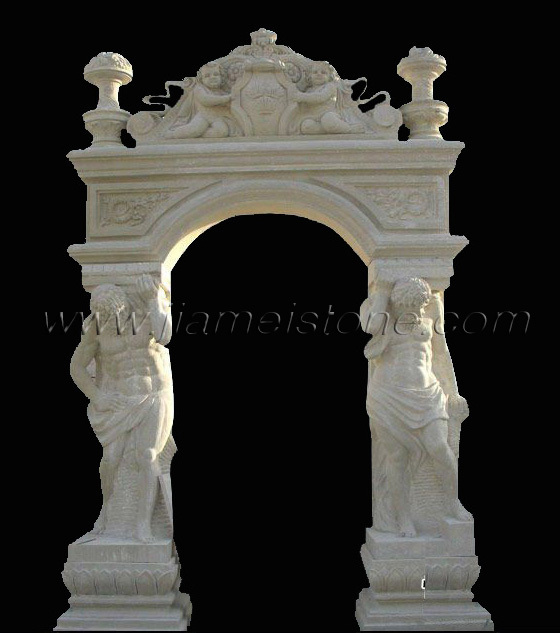 Custom dimensions and sizes available. 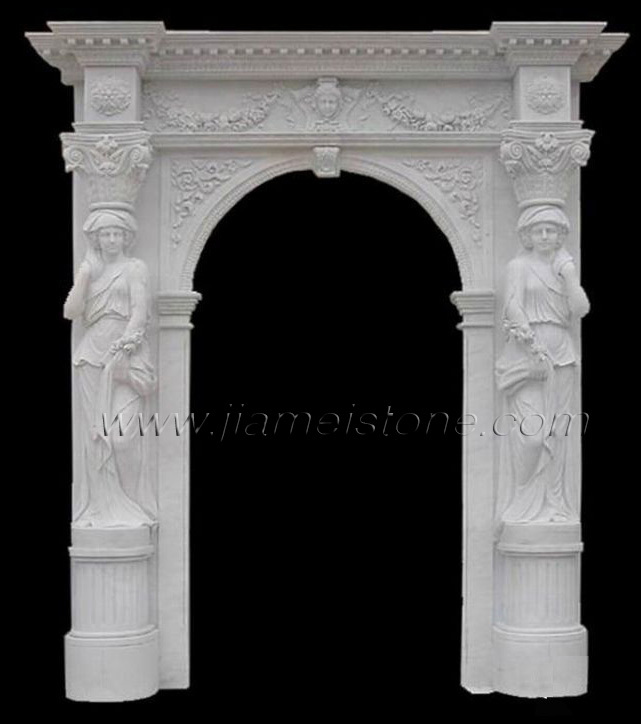 Custom designs and styles welcome. 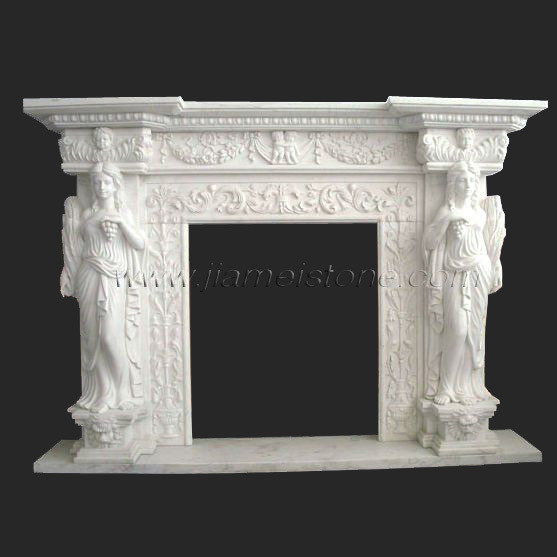 Volume discounts. 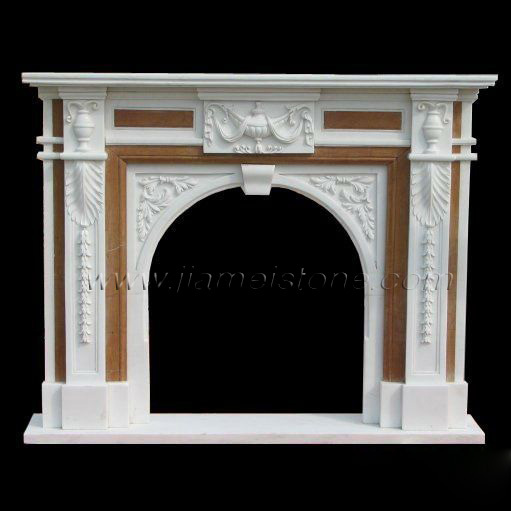 Decorating a wall above stone fireplace could be tricky. 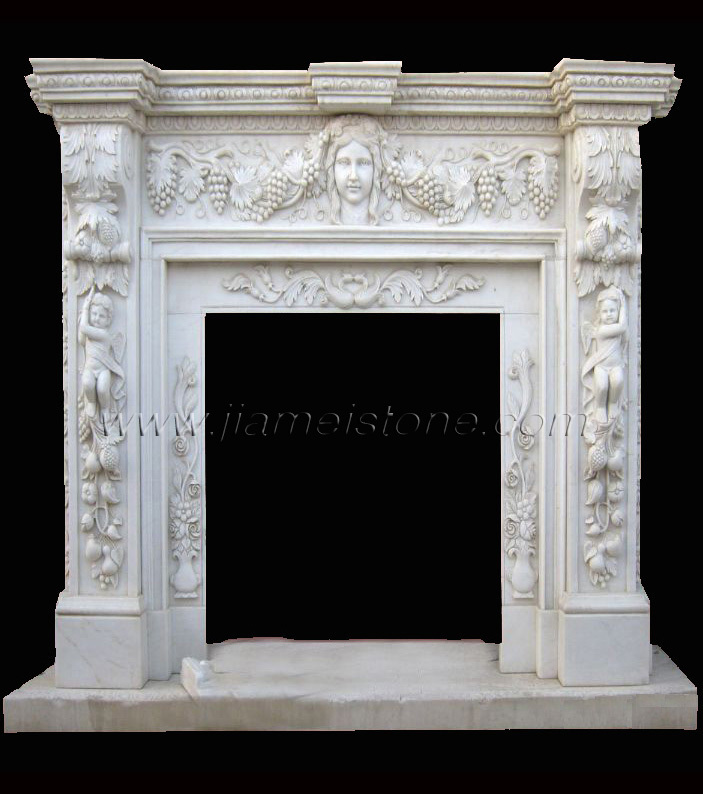 Stone fireplace mantel surrounds, such as marble fireplace surrounds, travertine fireplace surrounds or limestone fireplace surrounds attached with an over mantel can be the best solution. 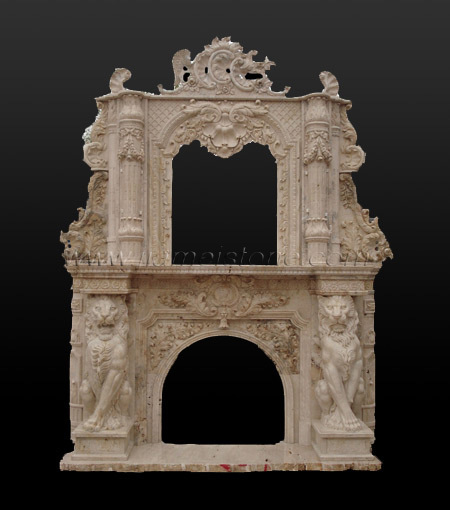 Look at these luxury marble fireplace, travertine fireplace and lime stone fireplace surrounds, they are perfect choices for fireplaces installed in high ceiling rooms, churches and grand halls.JIamei specializes in hand carved stone fireplace surround with overmantel, featuring marble fireplace overmantel and travertine fireplace overmantel. 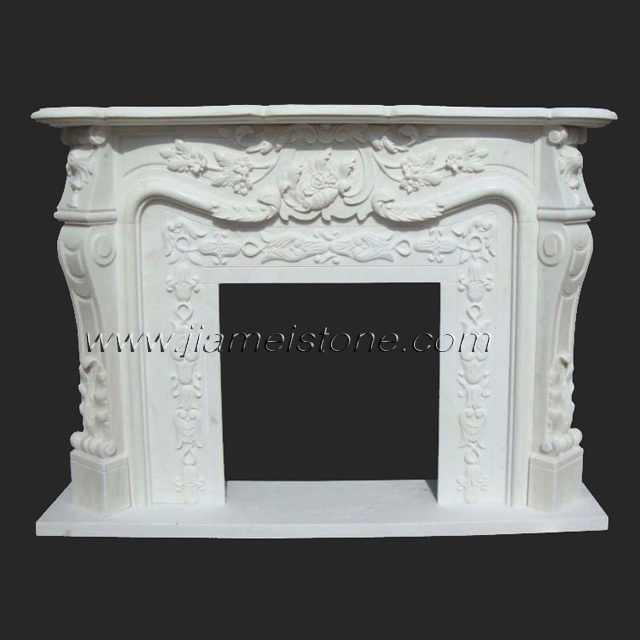 Each and every Jiamei marble travertine stone fireplace surround with overmantel is hand carved with great accuracy and intricate details. 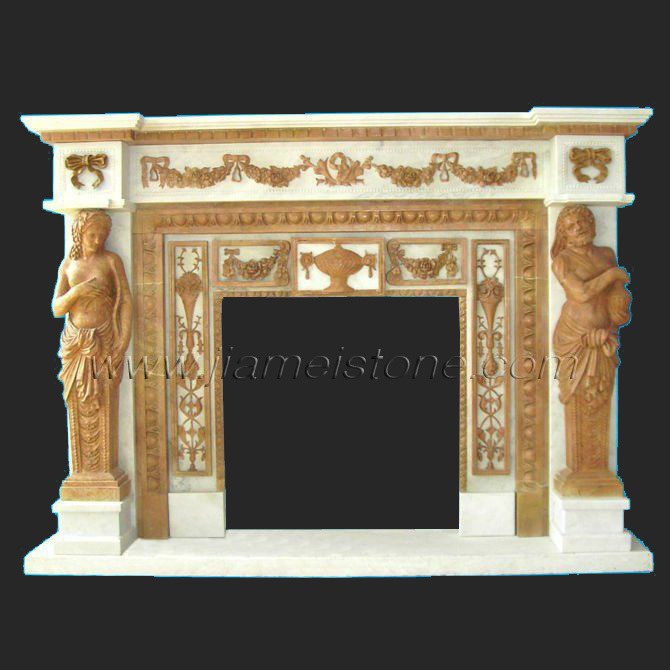 Custom carved marble travertine stone fireplace overmantel available. 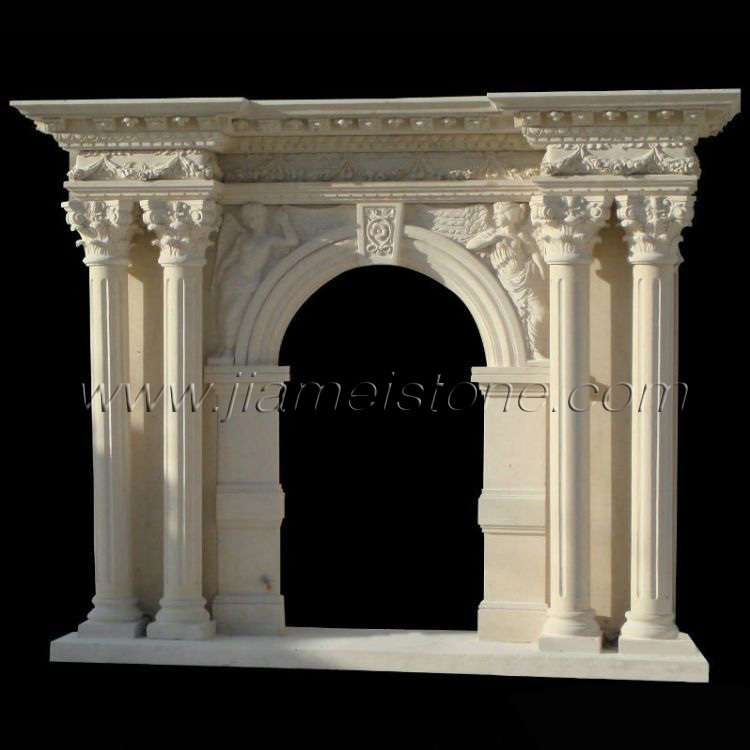 Other materials: limestone and sandstone. 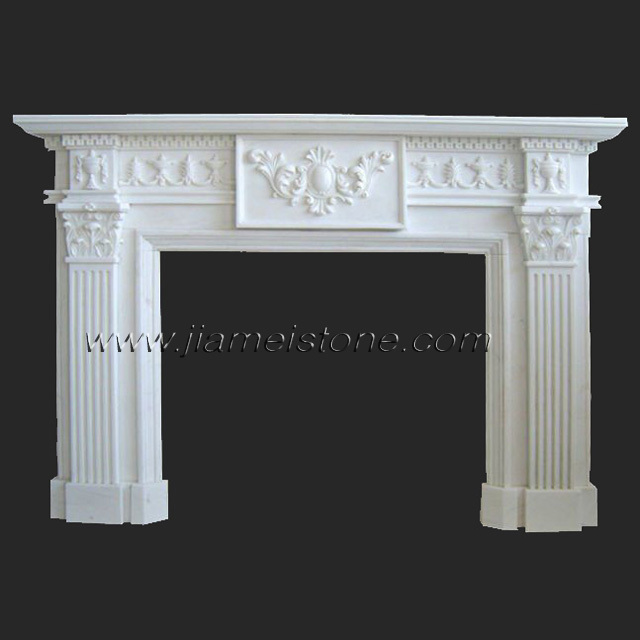 Marble stone fireplaces in column pillar configurations typically incorporate with some carvings. 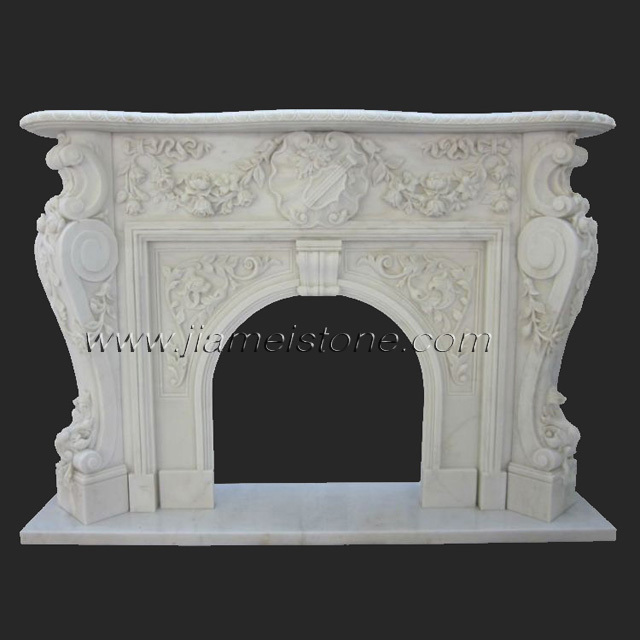 This type of marble stone fireplace has a contemporary look and fits in many architectural themes well. 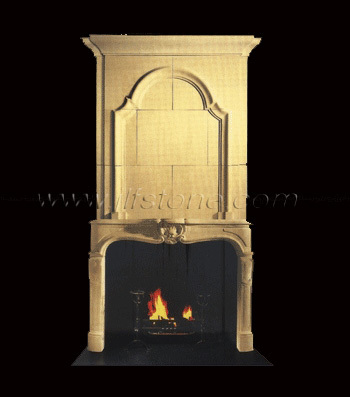 Column stone fireplaces tend to have large sizes so require wide spaces. 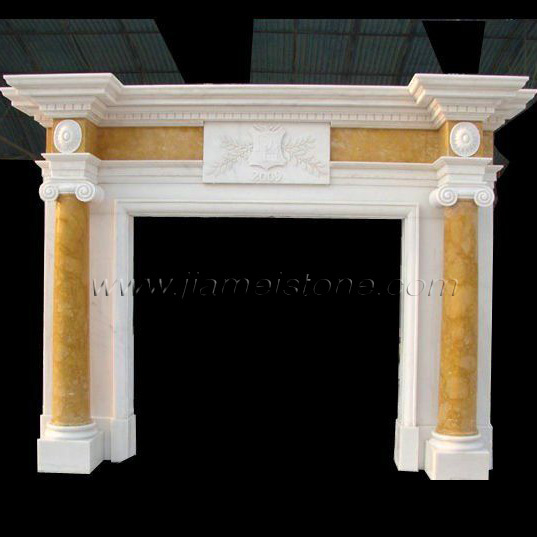 Columns in these marble fireplace surrounds can be Doric, roman or Corinthian. 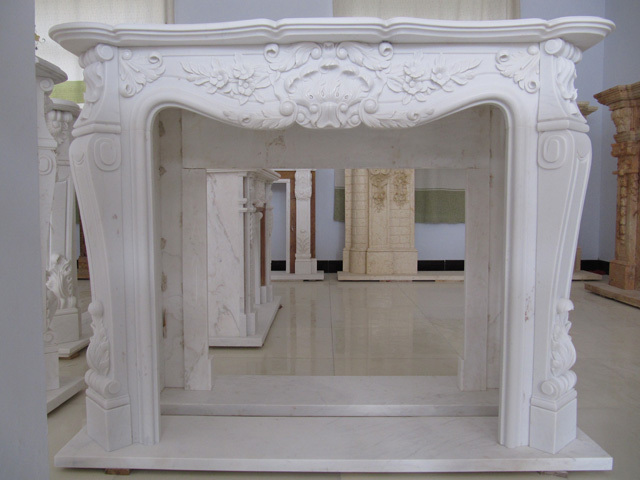 Depending on overall theme of the space, a multicolor marble fireplace may have perfect fit. 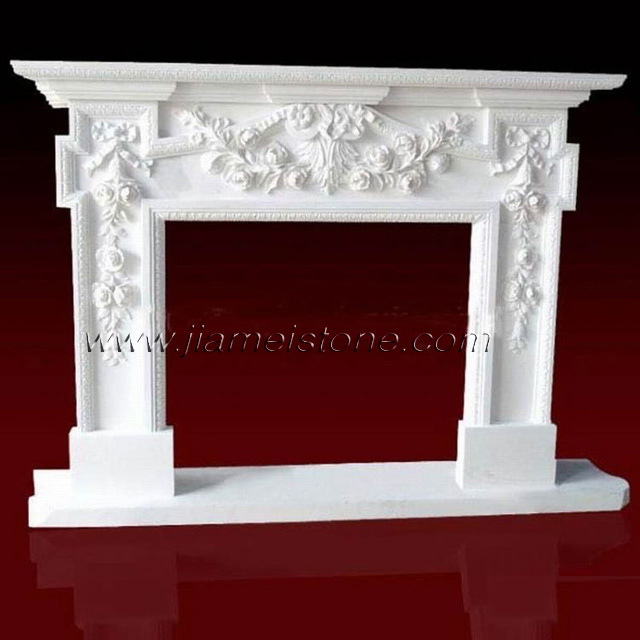 Marble fireplace mantels in this category can have carved statues, flowers or just simply fabricated. 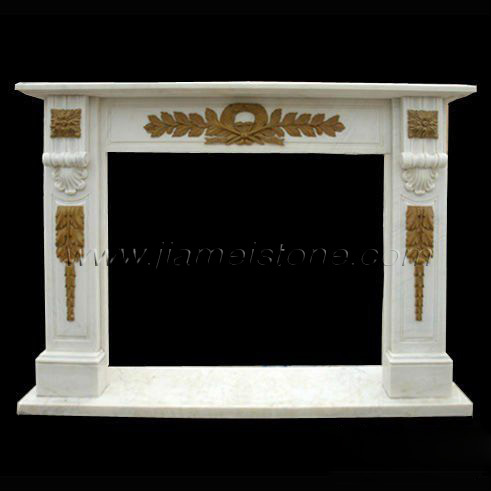 Stones suitable for this group of fireplace mantel surrounds are marble and travertine. 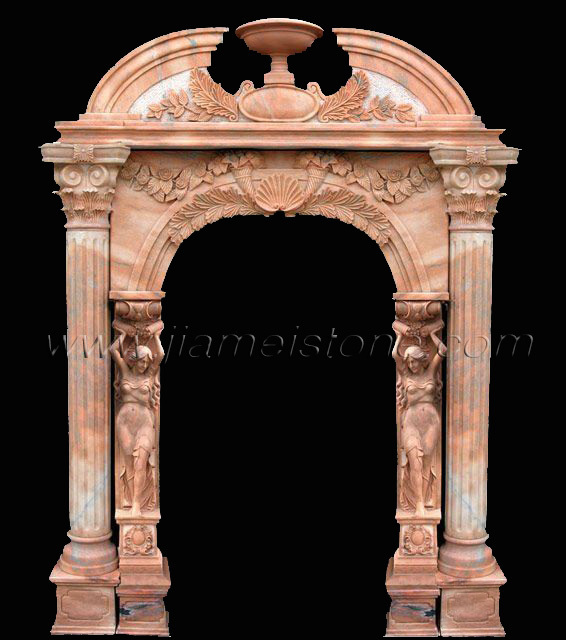 Custom styles, colors and sizes available. 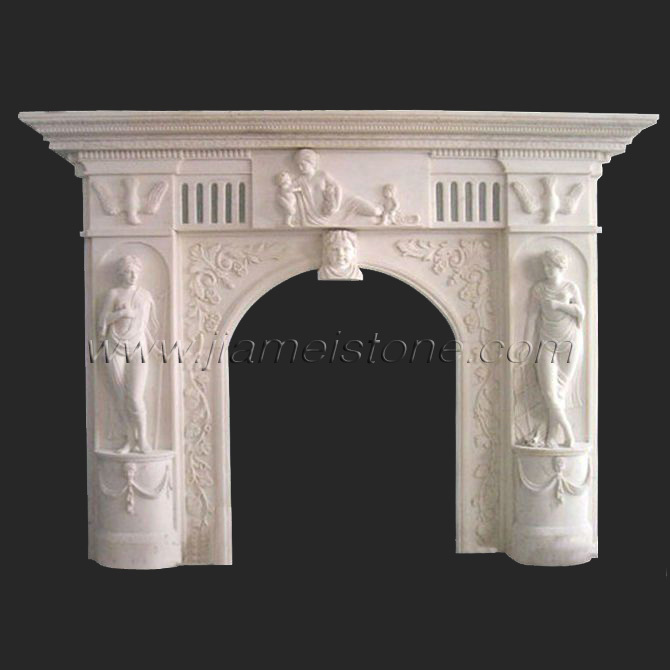 Luxury does not always have to carry a big price tag. 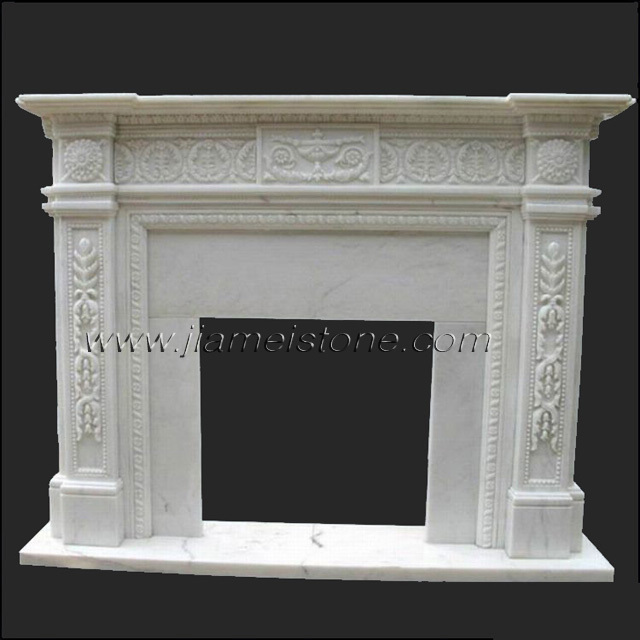 This series simple marble fireplace mantles and stone fireplace surrounds can do just that. 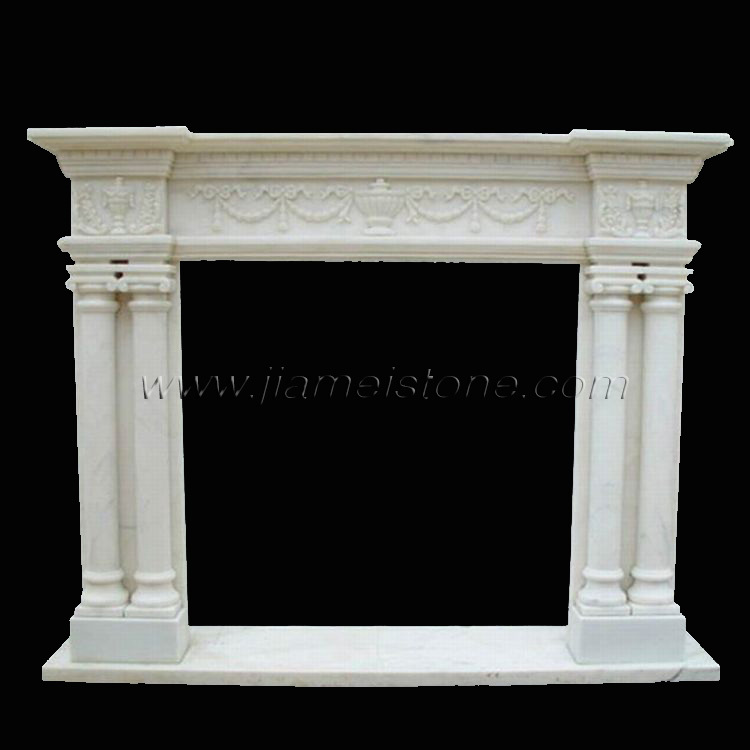 This type of marble fireplaces can bring natural beauty and elegancy of the stone to your home in a cost effective way. 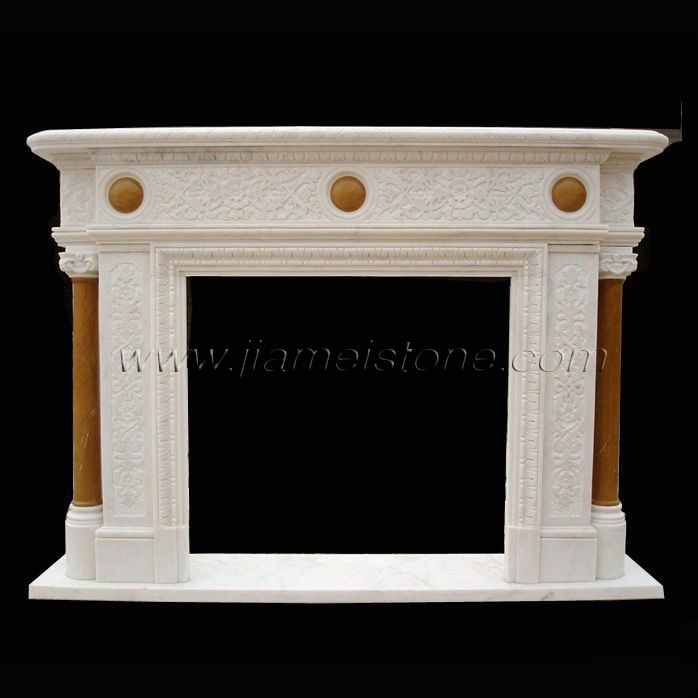 Simple stone fireplace surrounds are available in virtually any natural stone types including marble, granite, travertine, limestone, sandstone, and even slate. 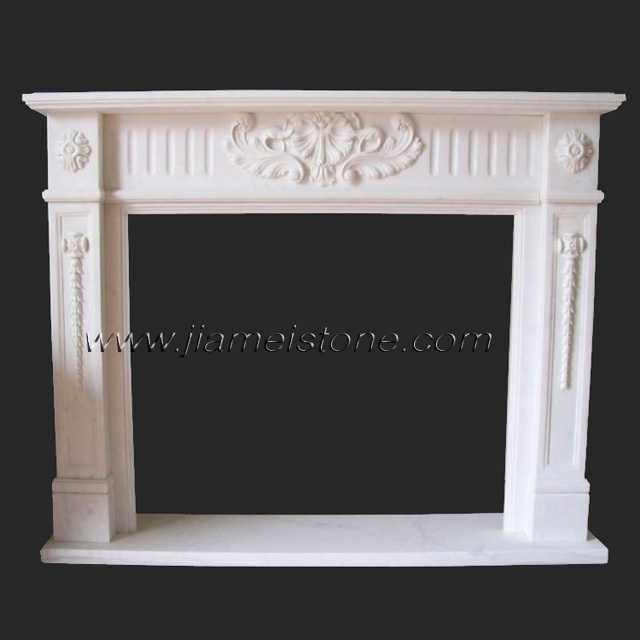 As typical simple marble fireplace mantel and surrounds involve mainly fabrications instead of carvings, fast mass production of this category of marble fireplaces is available for large projects such as hotel renovations, high end condominium constructions and subdivision developments.